As a microbiology major, you will learn how microbial genes, proteins and processes are being exploited in the exciting field of biotechnology to help cure diseases, generate alternative fuels, produce new antibiotics and recover valuable metals from ores. Under the direction of faculty advisors, our students are given opportunities to conduct important research to help them be successful in future research-focused careers. For more information visit the Department of Microbiology website or view the university's major curriculum sheet. Have a question about Microbiology or want more information? Let us know. Many of our students go on to graduate, professional or medical school receiving masters, PhD or MD degrees. Students go on to conduct research at universities, hospitals, pharmaceutical companies and research institutes. The best preparation for the microbiology major is a strong math and science program with biology and chemistry courses. Enriched, advanced or honors courses, courses with an associated laboratory, and research experience are encouraged. If possible, computer literacy should be included. Good written and oral communication skills are also important. 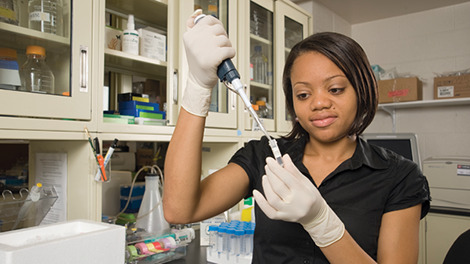 The microbiology major prepares students directly for employment. The diversity of required courses provides a breadth of learning and technical experiences. With this education, especially the technical training learned in the laboratories, students can readily find employment in research, quality control or hospital laboratories and work with advanced techniques and instruments. Fundamental principles of microbiology and the characteristics of microorganisms with emphasis on their structure, molecular biology, growth, classification, physiology, ecology, biotechnology, ecology and applied microbiology. Provides an overview of microbe-host interactions with an emphasis on virulence mechanisms of bacterial pathogens, host infection routes, immune recognition of microbes, and the cellular and molecular effectors of the host immune system. Principles of microbial growth, metabolism, microbial structure and function and regulation of microbial metabolism. Structure, maintenance, expression and exchange of genetic materials in microbial cells. Advanced laboratory covering structure, maintenance, expression and exchange of genetic materials in microbial cells and methods in immunobiology. The purpose of this organization is to promote a closer scientific relationship among persons interested in microbiology, to cultivate social relationships and cooperation among such individuals, and to promote cooperation with other Ohio Branch ASM student chapters, the Ohio Branch ASM, and the National ASM. Multiple microbiology scholarships aimed at all types of deserving students pursuing a degree in Microbiology at Ohio State.